Maurice Grant, a tall, slender man in a tailored Brioni suit, stands on stage, introducing the evening’s honoree at a recent fundraising dinner for Chicago State University. Grant, board chairman of CSU’s foundation, has not forgotten his roots. He tells attendees that the South Side school needs help because its students are mostly people of color, many of them struggling single parents. Grant, 56, is co-founder and principal at the seven-lawyer firm Grant Schumann in Chicago. His parents, who didn’t finish high school, came north from rural Mississippi in the early 1950s to seek a better life and job opportunities. Growing up on Chicago’s Southeast Side, Grant saw friends die of drugs and gang warfare. He had his school lunch stolen from him at gunpoint when he was 12. But his parents watched over Grant and his sister closely, dressed him in suits, “whupped” him when he was bad, took him to church, and paid for piano lessons from the time he was 4. He became an accomplished classical pianist, competing throughout his teen years. “Piano competitions are way harder than trying a case,” he says. Grant won a music scholarship to DePaul University; even so, he had to work nearly full time to support himself through college and law school. 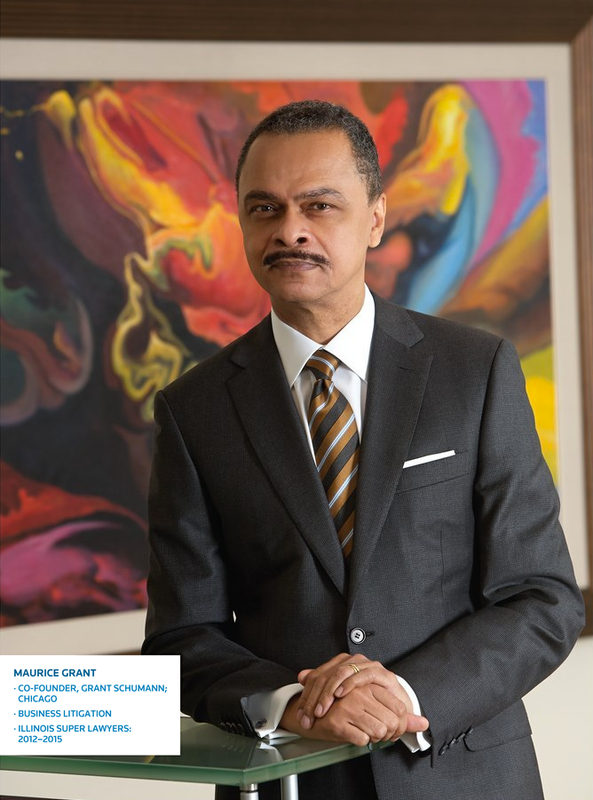 Now Grant co-leads one of the handful of black-owned law firms in Chicago handling litigation and transactional matters for large corporations and government agencies. His clients include the likes of Wal-Mart, Integrys Energy Group, Citigroup, JPMorgan Chase, the Federal Deposit Insurance Corp., and the City of Chicago. In the last few years, Grant and his firm have gained attention with a number of significant cases, including: a 2012 dismissal for the FDIC of a federal negligence and breach of fiduciary duty suit; a favorable 2013 settlement for a meat-processing firm in a Fair Labor Standards Act class action involving nearly 100 workers in an overtime case; and the rewriting of contracts, including one with the gravediggers’ union, in the wake of the bankruptcy of the historic Burr Oak Cemetery, which was hit by a scandal involving graves dug up to resell plots. “He’s very astute at understanding the issues and sensitivities,” says former Circuit Judge Patricia Brown Holmes, court-appointed bankruptcy trustee for the cemetery. Holmes is a partner at Schiff Hardin and the incoming president of the Chicago Bar Association. Despite the numerous successes and the high praise from in-house attorneys who have hired him, Grant says he still has to be relentless to get new corporate business—even as corporate executives claim they strive for diversity. “Most of that is just rhetoric,” he says. Mara S. Georges, Chicago’s former city corporation counsel, laughs when recalling Grant’s persistence. “He must have the best calendar system, because every few weeks he would call and very professionally say, ‘We did this for you; how about more work?’ He’s very personable and it was always nice to hear from him.” Georges, currently a partner in her own firm, now seeks Grant’s advice on rainmaking. She agrees with his assessment that minority- and women-owned firms are at a disadvantage. “A lot of in-house counsel understand that, when a case is unsuccessful, if they can say they used the biggest, most expensive firm, no one can throw darts at them,” she explains. Deciding a career as a classical pianist wasn’t in the cards—“I wasn’t going to be the next André Watts, and I realized that at 18”—Grant graduated from the University of Maryland School of Law, where he was editor on two journals. He went on to clerk for Justice Calvin Campbell at the Illinois Appellate Court, serve as an adjunct professor at Illinois Institute of Technology Chicago-Kent College of Law, and become the first-ever black associate at Much Shelist. Then he decided to open a solo practice. While his original goal was to become a partner at a big firm, he saw that, as a black attorney, he would face barriers. “Most partners hire people who look and talk like them,” he says. In 2004, Grant decided to launch a firm with two other solo black attorneys, Anthony Schumann and Geraldine Holt. It took years of determined outreach to get cases from corporate and government clients. He started contacting Wal-Mart in 2006 and finally got his first two matters from the corporation in 2014: an ongoing Americans with Disabilities Act case and a racial discrimination claim. He’s fiercely proud of snaring big companies as clients and serving them well. “Their business means everything to me,” he says. Grant is particularly proud of the FDIC case. It was a 13-count federal claim that accused a trustee—a failed bank overseeing two land-trust agreements—of acting negligently and fraudulently and allowing the trustholder to be defrauded out of $10 million; the FDIC was the receiver for the bank. Grant got the call, along with 19 boxes of documents, from the federal agency in November 2011; he was asked to replace another law firm. Working with his associates, Grant had until the end of February 2012 to prepare a motion for summary judgment while defending an opposing motion for summary judgment. It was a big job in a tight time frame for a small firm, involving complex legal issues about who had authority to direct transfers of trust property and the nature of the trustee’s fiduciary duties. On top of that, the client wanted the brief two weeks early. But in August 2012, Grant and his team won the case outright on summary judgment in a 27-page opinion. 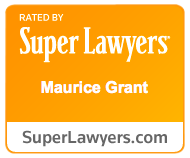 Grant hates to lose—in law, tennis, piano competitions or anything else. “Losing is not my heritage,” he says. So it pains him that in 2014 he lost his first trial in 16 years, representing a large municipal agency in a circuit court lawsuit brought by an auditing firm to recover fees. But his opponent says it was a “game-changer” when Grant took over from government staff attorneys, turning what looked like a blowout win for the auditing firm into a more difficult case. After giving his associates detailed instructions and debriefings on hearings and trials, Grant often lightens the mood by taking them out to his favorite Italian café for sausage or chocolate chip cookies. “My one vice is chocolate,” he says with a smile. Walking around his office and pointing out the many art pieces he has collected, with titles like Slave Vessel Chronicles and Nostalgic View of Black America, Grant returns to the theme of widening legal opportunities for minorities. He aims to continue promoting a standard of excellence so that clients and other attorneys have confidence in the quality of representation provided by minority lawyers. This article originally appeared in Leading Lawyers Magazine—Real Estate Edition for 2017 by Dustin J…. Grant Law LLC announces the appointment of two new Associates at the firm.